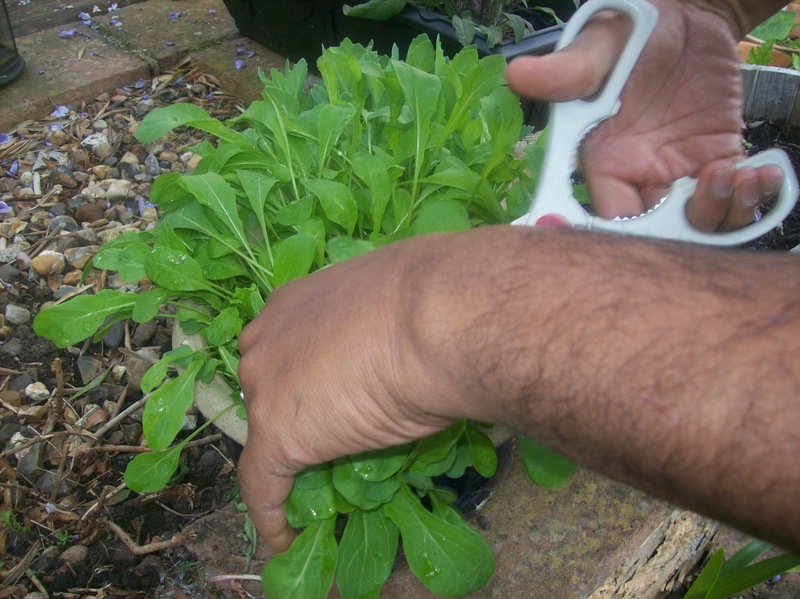 Gardening | Life's Conundrum - Eat to Live or Live to Eat? Wanted to share with you a wonderfully simple salad we had the other night with leaves from our garden. 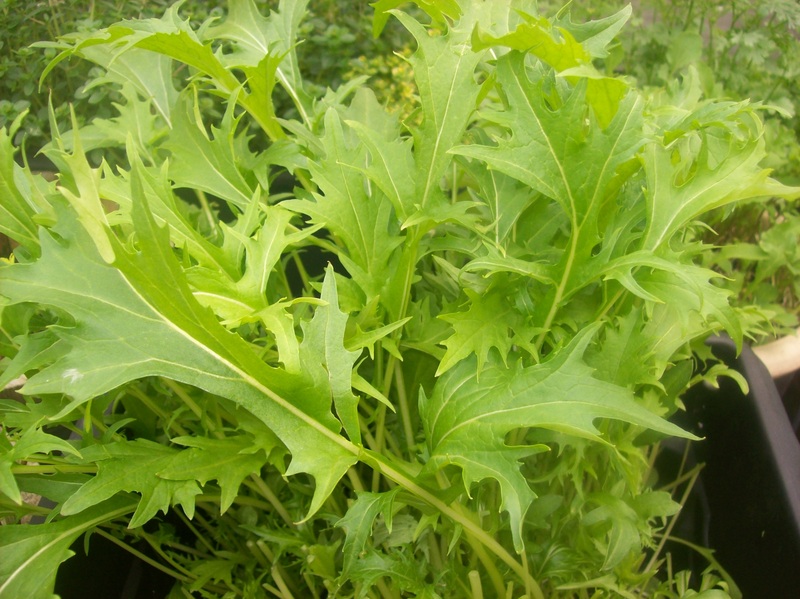 The salad was a mix of mizuna leaves, mustard leaves and tender carrot leaves. The leaves were washed and chopped into bite size pieces and mixed with cherry tomatoes. 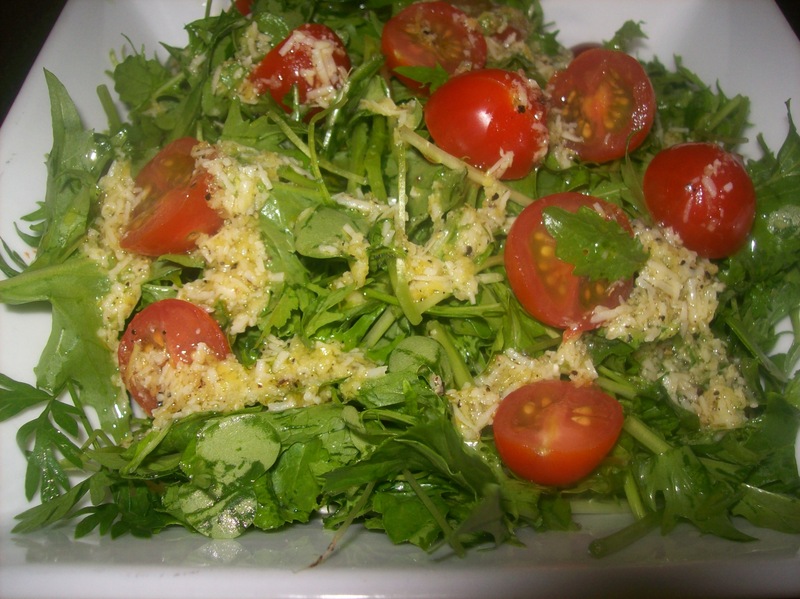 The dressing was a blend of walnut oil, lemon zest and juice, grated parmesan cheese and a pinch of salt and pepper. Nothing to beat a fresh salad from the garden. Watching my little vegetable garden grow and thrive is giving me immense joy and pride these days. We are finally seeing some sunshine and can feel the British summer arrive at long last. The extended daylight hours are a great blessing as I tend to linger longer in my garden, weeding, fussing over my plants and generally pottering around. 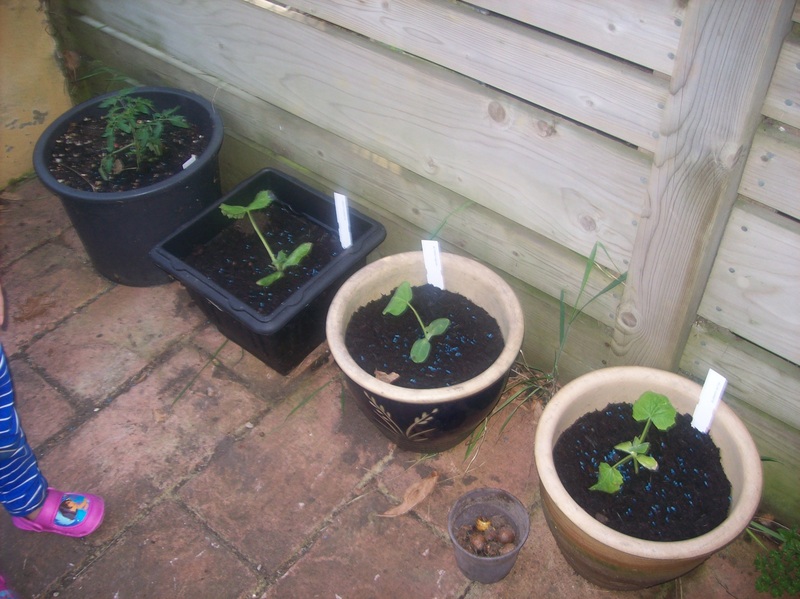 My courgettes, squash and tomatoes have started to flower and I can see little red bulbs of radish poking their heads out from the soil. Shiv, my mother and the kids are showing interest in the garden which gives me added pleasure. I do have my share of sorrows as the neighbourhood cats still think that my garden is their toilet. I have tried hard to keep them off but alas, nothing seems to work. A friend suggested a website which sells predator pee. I am quite sceptical to try it and think I’d rather have Shiv or Ansh mark their territory in the garden. 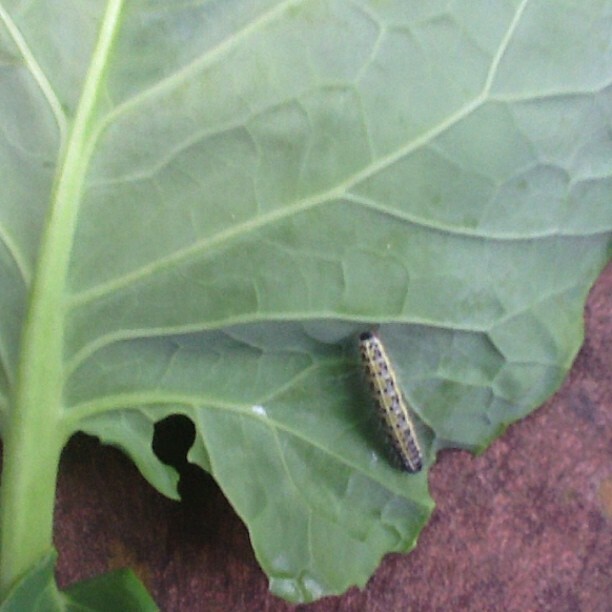 Then we have the problem of unwelcome guests from the pest kingdom who visit our garden in biblical proportion. 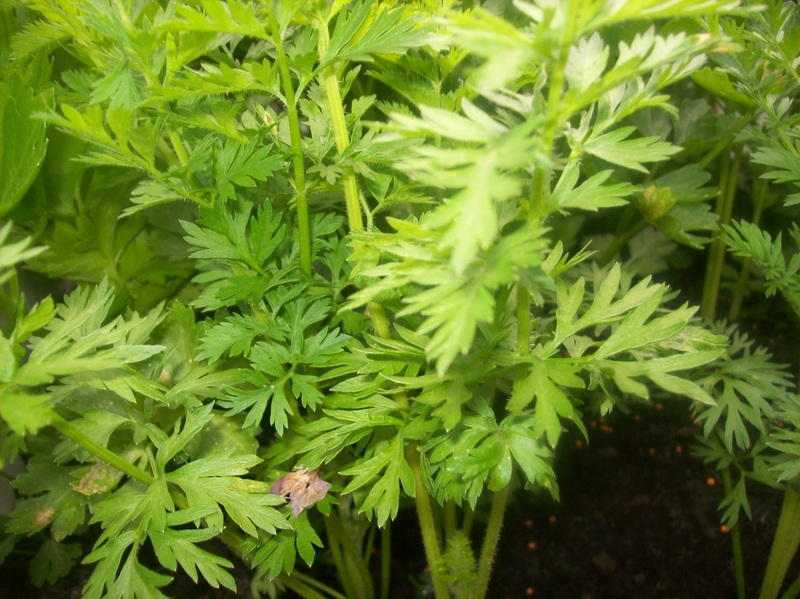 I have made a homemade pesticide, which I believe is fairly potent in keeping pests away. My Dad gave me this recipe years ago and I hold it very dear to my heart as with all my memories of him. Pour these into a sprayer bottle and shake till you get a murky emulsion. 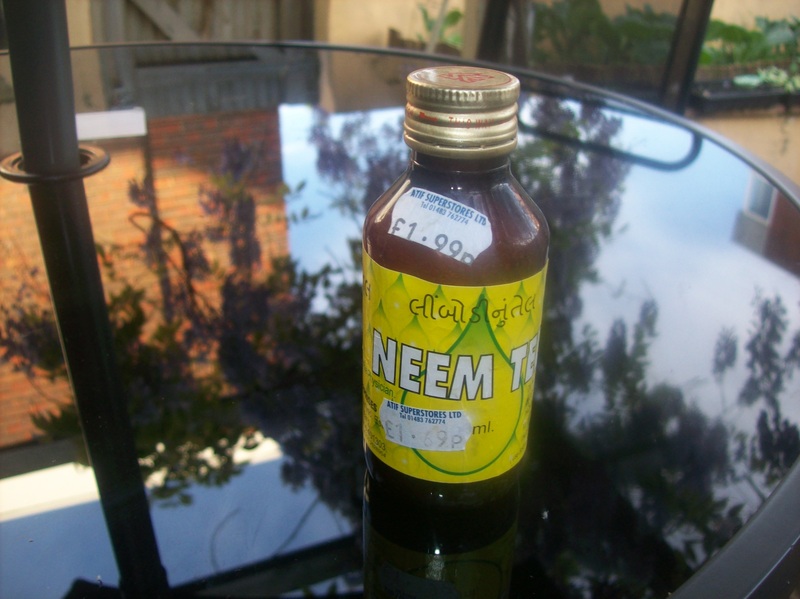 Neem oil smells vile but believe me its benefits are many. I am convinced that my courgette plants’ leaves have been spared of powdery mildew because of my spraying them generously with my home made Neem oil pesticide. After skipping last year our little garden is back with a vengeance. 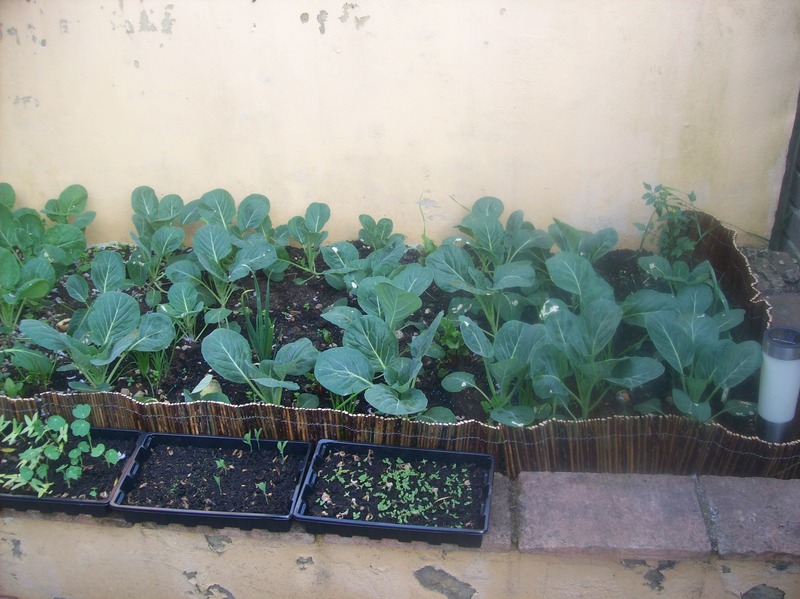 Anna has taken a lot of time and effort to clean up the back yard and plant a range of vegetables, herbs and salad leaves. 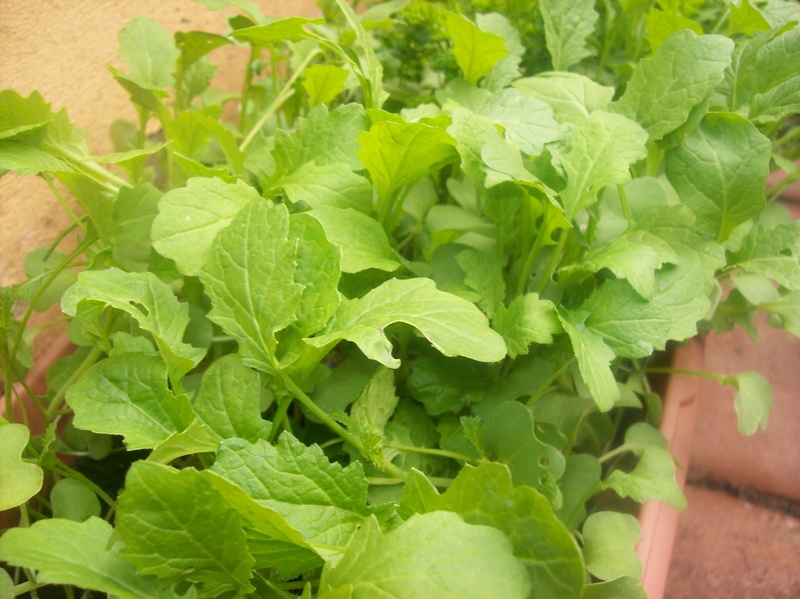 Our pot of rocket leaves has given us our first garden meal of the season – recalling the dressing that Magi had served me in Dubai I pulled together a rocket salad with pomegranate seeds and baby plum tomatoes and dressed it with homemade baba ghanouj/muthabal. 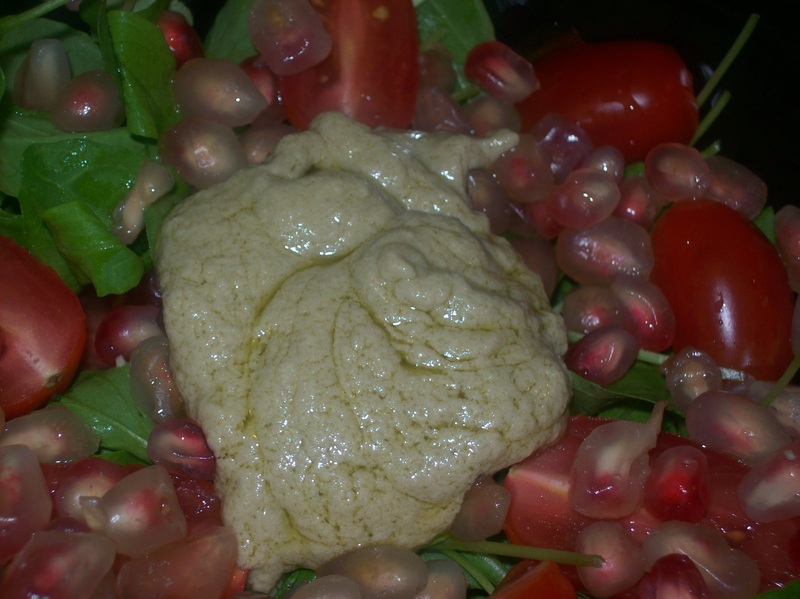 Once you prepare a fresh baba ghanouj or hummus you will stop buying the ready made stuff. Here’s my interpretation of the classic Middle East dip which was ground a little finer than it should have. Rub little oil to the eggplants and roast in hot oven (200 degree s in a fan assisted electric oven) or alternatively roast over open flame till skin is blackened. Allow eggplant to cool before skinning it and keep aside. Put all ingredients into a blender and blitz to a chunky consistency. Serve with pita bread, corn chips or use as salad dressing. 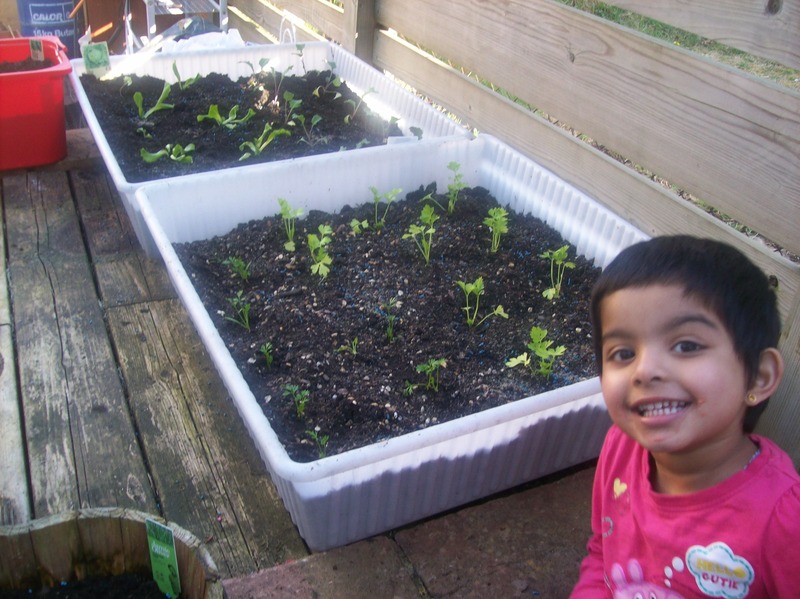 I decided earlier this year that I was going to go ahead with our growing our own project. I have been weeding, digging and preparing our back patch whenever we had some sunshine and I cleaned and prepared all my containers too. I did not do anything in my garden last year with Shiv being ill so clearing up took quite a bit of time. This year I wanted to do something different. I usually plant by seed and end up with lots of seedlings so I decided to buy plug plants of only what I needed. We went shopping for plug plants in the Homebase garden centre and I am hugely impressed by the wide range of veggie and herb plug plants that they have. We bought what we needed and the weekend was spent planting the plug plants. 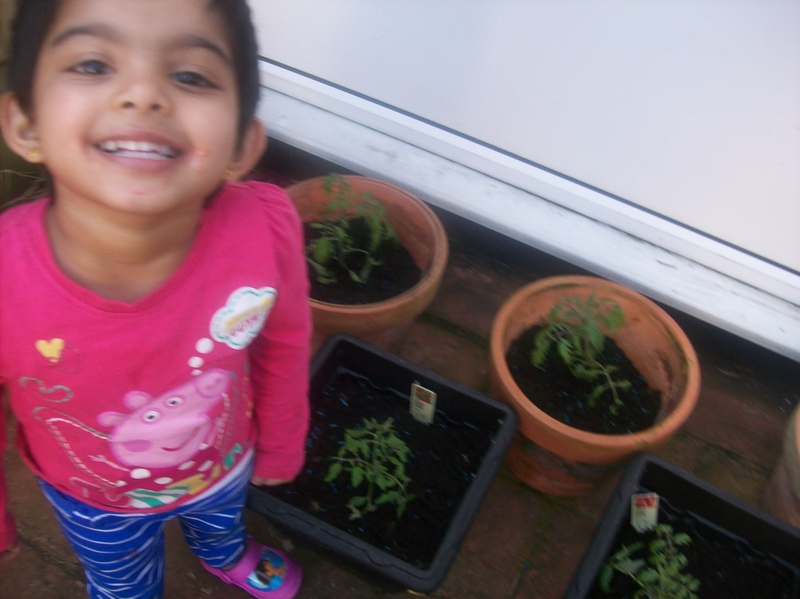 The planting has all been done and precautions taken to keep cats and slugs away. 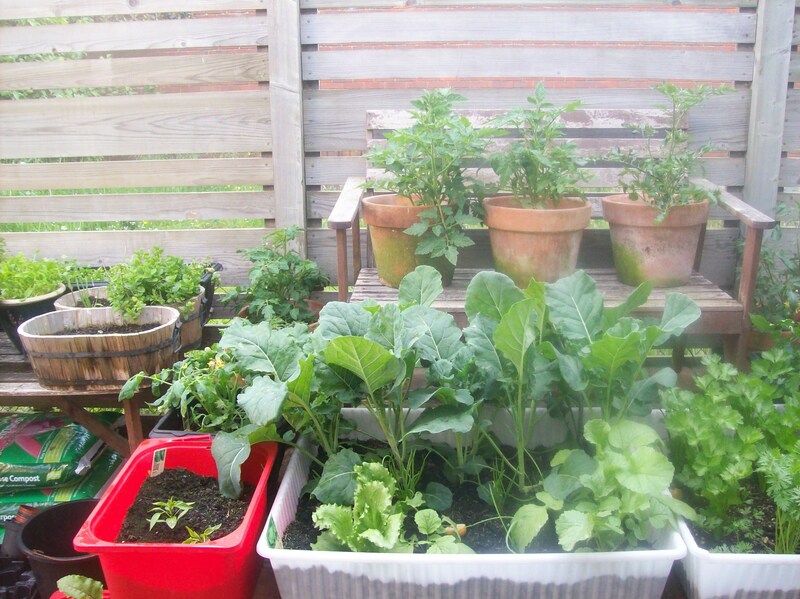 I hope my plants grow and we have the joy of harvesting and cooking fresh from our garden.